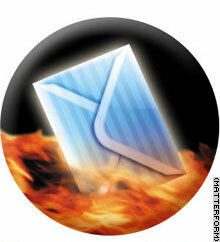 The key to guarding against spam, experts say, is keeping your e-mail address private. This means deleting incoming chain letters before even opening them, because hidden code in the e-mail might confirm your address as soon as you open the message. And you should ask friends not to forward you chain letters, said Bill Orvis, of the U.S. Department of Energy. That will keep your address from showing up in a forwarded message that could eventually make it to the hands of a spammer. "If your e-mail address is being put out there, the bad guys are going to get it," he said. (CNN) -- Forget bad luck. Those annoying chain letters circulating the Internet could be cursing you with an inbox full of spam e-mail, computer experts warn. While not as efficient as "spiders" which automatically crawl the Web in search of addresses, computer experts warn that some spammers are using chain letters to collect e-mail usernames. "Chain letters are the ideal place to collect addresses. I've seen several hundred on one e-mail. The list went on for pages," said Bill Orvis, who maintains the U.S. Department of Energy's hoax advisory Web site. Organizations that help users and companies fight spam have begun to take notice. Orvis, for example, recently posted Web warnings for government employees and the public, pointing out the dangers of forwarding chain letters. So far, no spammers have been caught harvesting e-mail addresses from chain letters, but Orvis thinks it's just a matter of time. "Just by forwarding a message to a dozen friends, it only takes a few generations before you fill the network with messages," he said. Other spam experts, however, are skeptical about this tactic. Michael Herrick, whose Spamfire software helps individual users filter junk e-mail, doesn't think spammers are using chain letters in this way. Pam Small, spokesperson for the spam filtering company SurfControl, was also skeptical about the use of this tactic. "Yes, it can be done, and yes, it may be done by some of the less sophisticated spammers," she said. "But because spammers are dealing in high volumes and looking for valid e-mail addresses, there are quicker ways to gather them." Herrick, however, admits that the practice could be a good way to bypass e-mail filters which block messages from senders who are not known to the recipient. Spammers could use chain letters to discover the addresses of people with whom you frequently communicate. Spam purporting to be from someone in your address book would sneak by filters. "If I were a spammer, I'd be working very hard to perfect this technique," he said.